Arc of light : music of Australian composers. 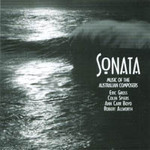 Sonata : music of the Australian composers Eric Gross, Colin Spiers, Ann Carr-Boyd, Robert Allworth. Instrumentation: 2 mandolins, mandola, guitar.